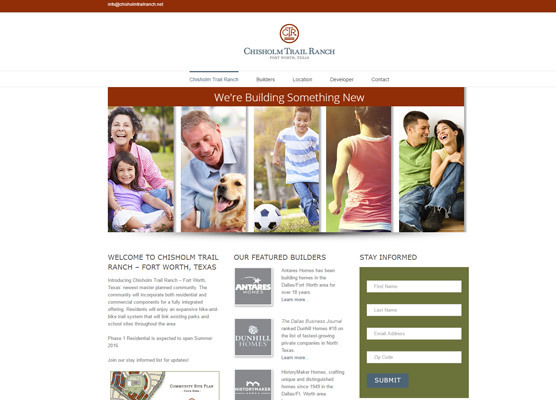 The newest community micro-site launched for Walton USA is Chisholm Trail Ranch in Fort Worth, Texas. Launched in April 2016 with the “We’re Building Something New” campaign theme, this residential and mixed-use community development in the south-west suburbs of Ft. Worth will feature trails and other community amenities. Four featured builders will provide diversity of design and home plan options. Following Walton’s corporate design and legal guidelines, etainia designed a lifestyle-centric image-montage. Registration forms and automated-communication touch-points are in place and integrated in the client’s CRM. Etainia provides ongoing maintenance, SEO, email marketing and strategy.